Each September the summer comes to a close and kids start heading back to class. And, while every child should be excited for the new year, the sad truth is that far too many of them are dreading it. Bullying and cyber-bullying is a harsh reality that many children face. And, while society is working to solve this problem, I Am Stronger is aiming to speed up the process. In partnership with the Saskatchewan Ministry of Education, SaskTel’s I Am Stronger works to change the culture around bullying and cyber-bullying by raising awareness on this important issue and by providing tools and techniques that teachers, parents and students can use to stop bullying in its tracks. To accomplish this, I am stronger regularly visits schools to speak with students about how they can prevent bullying and cyber-bullying. Students, parents, and teachers also have access to iamstronger.ca where they can find many resources for use in their fight against bullying. I Am Stronger also partners with the Ministry of Education to host a bullying reporting tool on its website. The tool allows anyone to get help dealing with bullying by allowing anyone to report being bullied from anywhere in Saskatchewan and at any time. But one of the most important ways I Am Stronger is helping to end bullying is getting youth to take an active part by leading their own initiatives with funding from I Am Stronger’s small grants program. Through its partnership with the Ministry of Education, I Am Stronger provides grants of up to $1,000 to young individuals or groups that will help the recipients take their ideas to promote kindness and turn them into actions. Over the past two years, the grant program provided more than $45,000 dollars towards youth-led initiatives and one of the most recent recipients was Grade 10 student Maham Fatima. Her grant helped her launch a plan to get students at Fairhaven School in Saskatoon to become kinder and more caring people, by brining older and younger children together as Care Partners so that they can provide each other with support and enhance their feeling of being included at school. See her grant recipient page here! If you are interested in finding out how you or someone you know can be like Maham and help stop bullying with the help of a grant, be sure to check out the grants page on iamstronger.ca. You can expect to hear more about grant recipients like Maham as I Am Stronger Month continues. 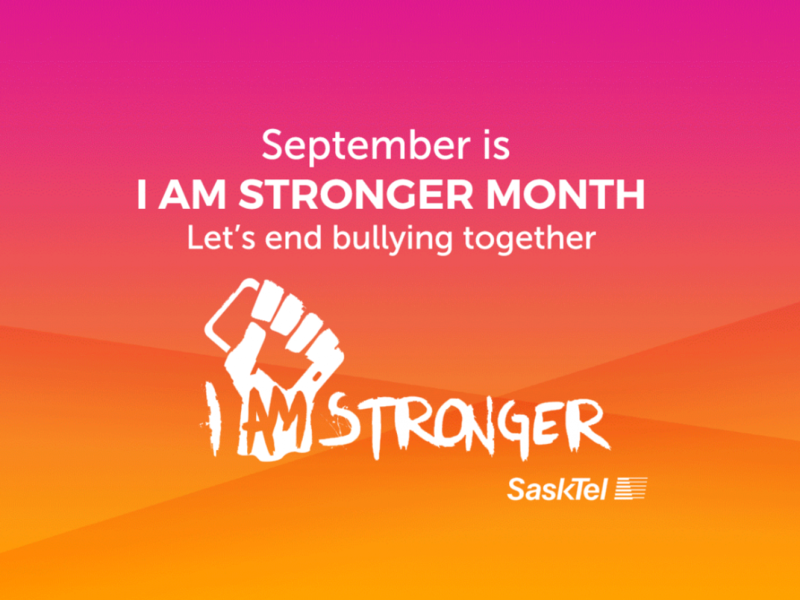 And, make sure to keep an eye out on SaskTel’s social media feeds later this week when SaskTel launches its I Am Stronger Month social media contest on Facebook.